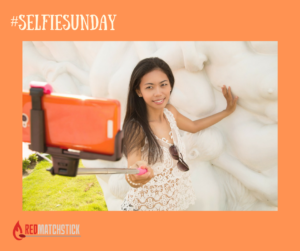 Perfecting your Selfie technique is an essential social marketing tactic! Practice makes perfect and these Selfie tips are sure to fast-track your skills! Practice your Selfie in private in front of the mirror when you are not embarrassed by your own vanity. Check yourself out from all angles and perfect your best Selfie pose, pout and posture! Excellent lighting is essential preferably natural sunlight but not scrunching your brow into the glare and shoot a grumpy Selfie! An interesting background really helps create a great Selfie setting. But make sure you don’t have trees growing from the top of your head or cars driving out of your ear! Best time of day to photograph your selfie is sunrise or sunset when the light is softer but mind any shadows across your face. Hold the phone so that the bottom of it is level with your eyes. Turn to the side ever so slightly instead of looking straight. Angle your chin down slightly but don’t accentuate a double chin. Smile with your heart and eyes, the rest comes naturally. Have fun, mess about and add your unique personality for the best ever Selfie. Once you have all these Tips come as second nature, your next step is to crack the Facebook Live Code where the angle, great light, background etc. are just as important! Suze Bouwer is founder and owner of RedMatchstick Marketing, created to offer on-the-job marketing implementation coaching to help small business owners and managers. Suze SHOWS HOW to do better modern marketing in a way that is simple to understand and easy to implement. Tapping into over 30 years’ of marketing experience; putting tried and tested tactics and strategies to work; she helps make the best use of limited resources without needing a fortune or a huge team. All that is essential is time and commitment! They BIG result is the peace of mind that comes from being involved in developing skills in your business and acquiring the know-how to ‘D.I.Y’ your marketing. This entry was posted in BLOG, Social Media and tagged pefect selfie, selfie, selfie tips. Bookmark the permalink. ← How to Help Customers choose YOU!